We’ve imagined SENDING PEOPLE TO Mars since well before Gagarin’s first spaceflight. Wernher von Braun, principal architect of the Saturn V launcher that delivered Neil Armstrong and Buzz Aldrin to the Moon, envisaged 1965 as the date on which the first humans might arrive at Mars. 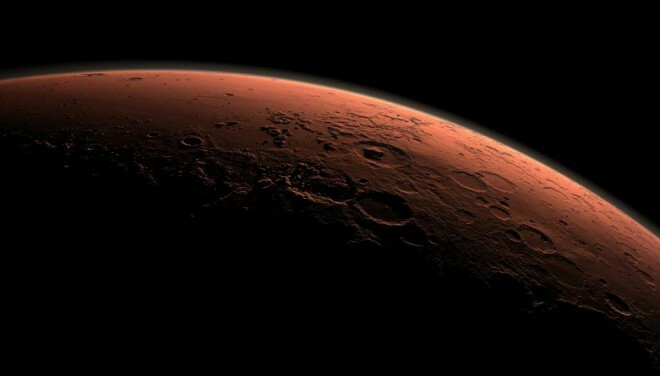 Since then, more than a thousand different technical studies have been conducted, most of them making the assumption that Mars lay little more than 20 years in the future. But that is where Mars has remained: always in our future. Space is not a single destination. Earth orbit, the Moon, and Mars involve very different voyages and challenges. Since the dangers were more immediate and dramatic for earlier missions — catastrophic explosions that no one could hope to survive — the ability of the human body to adapt to the extremes of terrestrial environments was largely irrelevant. Mars, however, presents a challenge of a different scale and character: It’s more a marathon than a sprint. Here the absence of gravitational load takes on a new dimension, transforming from a novelty into a creeping threat, because life on Earth has evolved over the past three and a half billion years in an unchanging gravitational field. In that context, it shouldn’t be a surprise that so much of our physiology appears to be defined by — or dependent upon — gravity. Take gravity away, and our bodies become virtual strangers to us. In our daily lives, gravity is that pedestrian physical force that keeps us glued to the ground. You have to go out of your way — climb a cliff face or jump out of a plane — before it starts demanding your attention. But we are constantly sensing the effects of gravity and working against them, largely unconsciously. Without the quadriceps, buttocks, calves, and erector spinae that surround the spinal column and keep it standing tall, the pull of gravity would collapse the human body into a fetal ball and leave it curled close to the floor. These muscle groups are sculpted by the force of gravity, in a state of constant exercise, perpetually loaded and unloaded as we go about our daily lives. That’s why the mass of flesh that constitutes the bulk of our thighs and works to extend and straighten the knee are the fastest-wasting group in the body. In experiments that charted the changes in the quadriceps of rats flown in space, more than a third of the total muscle bulk was lost within nine days. Our bones, too, are shaped by the force of gravity. We tend to think of our skeleton as pretty inert — little more than a scaffold on which to hang the flesh or a system of biological armor. But at the microscopic level, it is far more dynamic: constantly altering its structure to contend with the gravitational forces it experiences, weaving itself an architecture that best protects the bone from strain. Deprived of gravitational load, bones fall prey to a kind of space-flight-induced osteoporosis. And because 99 percent of our body’s calcium is stored in the skeleton, as it wastes away, that calcium finds its way into the bloodstream, causing yet more problems from constipation to renal stones to psychotic depression. Medical students remember this list as: “bones, stones, abdominal groans, and psychic moans”. The biological adaptations to gravity don’t stop there. When we’re standing up, our heart, itself a muscle pump, has to work against gravity, pushing blood vertically in the carotid arteries that lead away from our heart toward our brain. When deprived of the need to work against the force of gravity, the heart and its system of vessels become deconditioned — slowly taking athletes and turning them into couch potatoes. The system of accelerometers in our inner ear, the otoliths and semicircular canals, are engineered to provide the finest detail about movement, sharing their inputs and outputs with the eyes, the heart, the joints, and the muscles. These organs are not considered “vital” in the sense that they are not required to keep the human body alive. As a result, the essential role they play in delivering a finely calibrated sense of motion is often overlooked. Like all of the best things in life, you don’t really appreciate what you’ve got until you lose it. Imagine a gently oscillating, nausea-inducing scene from which there is no escape. That’s what it feels like when the organs of the inner ear malfunction. And that can be caused by disease, drugs, poisons, and — as it turns out — the absence of gravity. The impairments don’t stop there. There are other, less well-understood alterations. Red blood cell counts fall, inducing a sort of space anemia. Immunity suffers, wound healing slows, and sleep is chronically disturbed. There are a number of formidable problems that accompany long-stay missions. The first is life support. How do we invent a system that can keep a crew of four alive for nearly three years? For space stations, breathable oxygen requires electrolyzing a steady supply of water. But there is no easy way to resupply a team traveling to Mars, and so a number of ingenious solutions to this problem have been proposed. One involves a grow-your-own approach to life support and nutrition. It turns out that if you grow 10,000 wheat plants, you can generate more than enough oxygen to breathe while removing the human waste gas of carbon dioxide. Better still, you have a partial source of nutrition. For a while, the Space Center had a team of four volunteers locked up in a hermetically sealed tube, subsisting pretty independently on this self-regenerating, hydroponically grown life-support system. And that’s all great — until you factor in the possibility of crop failure. Another solution, discussed at a European Space Agency human space-exploration symposium, would be to grow vats of algae (which might be easier to sustain than wheat and would also provide a source of protein). Between that and the wheat plants, you could get halfway to a diet of pizza-like food — bread coated with flavored algae — and massively reduce the weight and volume of the food and life-support apparatus required for a Mars mission. A Frenchman who specialized in the field of regenerative life support told me how this might work, going so far as to explain the recycling of urine and the use of feces as a source of fertilization. Even if we figure out a way to negotiate the radiation and build a life-support system that is at least partly regenerative, we keep getting back to the most elemental problem: having to contend with the absence of gravity. In our daily lives, our physiology is maintained by only intermittent exposure to gravitational load — the standing up and stomping around we do during the day. Indeed, when researchers want to mimic the effects of microgravity here on Earth, they simply send a bunch of people to bed. Excerpted and adapted from Extreme Medicine, by arrangement with The Penguin Press, a member of Penguin Group (USA) LLC, A Penguin Random House Company. Copyright Kevin Fong, 2014.